Tamiya RC Car Kits have been around for many years & are "Build Yourself" Kits not "Ready To Run". They will require the addition of Radio Control Equipment & Batteries & Charger. Most Buggy & Car Kits are quite simple to build & maintain, making them suitable for Beginners & Younger Drivers alike. 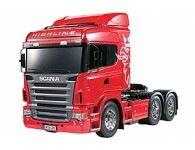 The 1/14th Scale Truck & Trailer Kits are more involved & require knowledge to assemble & get running.